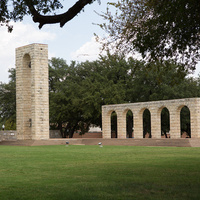 The memorial pays tribute to Luther Hall, the first building constructed on campus when UMHB moved from Independence, Texas in 1886. Luther Hall was considered to be one of the finest academic buildings in Texas, until it burned down on January 26, 1929. The memorial was constructed in 1955, from the stones of Luther Hall. It includes a bell tower with two historic bells. The Horton Bell, the lower bell in the tower, is from the University's first location in Independence. The upper bell, the sophomore bell, can only be rung by sophomores as a traditional privilege reserved for them. I was very excited when I found out I could watch it live on FB!!!! The students presented with humility and passion. It was wonderful! It was an amazing experience. People came up to me after the show, and told me how much the loved it. This was my first year to see the pageant and I was impressed by the scale of the production and the grounds. The soundtrack made hearing very accessible and the various scenes happening simultaneously were just right for a modern audience. The Jesus character praying at the end in front of the cross was meaningful. It was all incredibly moving and I found myself wiping away tears at several points of the pageant. Well done, UMHB, and praise God for holding the rain again! I enjoy this every year!